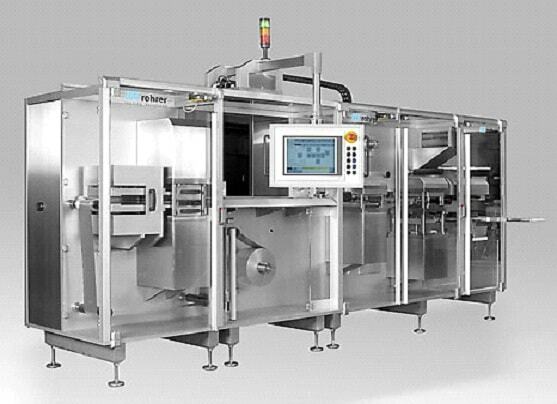 The R950 Blister packing machine is designed for automatic blister production in environments where small batch sizes demand fast changeover. Clinical trials and blister developments often require automatic production with increased flexibility. The R950 is compact and flexible. Tool changeover is rapid and set-up times are short. The balcony design meet GMP requirements for Pharmaceutical production. The R950 is a fully modular blister former. Forming is with Plug assist and can be fully controlled from the HMI. Puching stations, web transport and sealing is all servo controlled allowing for maximum repeatability and high levels of accuracy. Beyond the Blister forming machine itself we are able to offer validation and tool development services. Where requirements are high and tolerances tight we can work with you to develop a tool that meets the specifications. The Automatic Blister machine is a part of the Rohrer Range of blister machines.